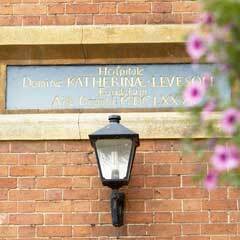 Lady Katherine Housing and Care takes its name from our founder, Lady Katherine Leveson, who in her will of 1674, provided for homes and care for older people. She wanted their lives, in her own words, “to reflect the Christian virtues of loving care and concern, whilst representing freedom for all”. More than three hundred years later, we remain committed to that ideal. There are presently forty-five units which include thirty-three self-contained apartments which have recently been refurbished to modern standards. Six of these are larger units which are available for couples. Each sheltered housing unit has its own shower room or bathroom and all have a kitchen. Most have a separate lounge and bedroom. The remaining twelve en-suite units are situated in the main house and extension to provide more specialised personal care for residents with particular needs. They are close to the central facilities, with access to care staff close at hand. Newspapers are provided in the communal lounge and a delicious daily menu is cooked on the premises and served in the pleasant dining room. The service is available to all residents for whichever meals they choose to take. 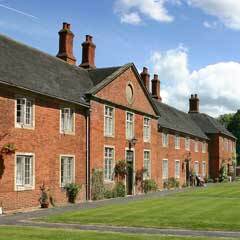 Meals served feature residents' favourite traditional home cooked dishes and all special dietary needs can be met. There is a local bus service to Solihull and Balsall Common, Monday to Saturday, which stops outside Lady Katherine’s, and the mobile library calls regularly for those who enjoy reading. The extensive site, with it's well-managed lawns and gardens, and the surrounding countryside offer varied choices for exercise and relaxation, and the local footpaths lead to a variety of nearby wildlife habitats, nature reserves and spectacular views. Temple Balsall is a unique and wonderful place, steeped in history and with it an atmosphere of peace and security. Lady Katherine had tremendous vision in her specification for accommodation over 330 years ago, and we have been able to build on and modernise her original designs and the 19th century addition to continue the work she start without destroying the beautiful buildings she bequeathed. Lady Katherine believed in the ideal of love and care for one another and it was her aim to provide a setting in which the needs of the less able could be met in a way that reflects the very best of Christian charity. In keeping with this we are committed to provide our residents with a service that is loving and dignified and respects their individuality. We take pride in nurturing and safeguarding our founder’s ideals and values which have enabled us to respond to changing times and circumstances in order to continue to deliver the best possible support and care. In short, we aim both to care for older people and about them as a community we cherish their dignity and individuality. In recent years Lady Katherine Housing and Care has responded to demographic changes with the increase in longevity which has opened up new opportunities and challenges for care and support. Since 1988 as well as providing housing for older people, the Foundation has delivered residential care. Furthermore in 1998 the Foundation registered as a provider of domiciliary care to ensure that residents in supported housing could receive the necessary care and services which enable them to live independently and well. Because the service we offer is personal, the residents, their families and members of the public judge the quality of our performance on the individual efforts of each staff member. In this context the quality and nature of our care are key elements in achieving our aims. We pride ourselves on delivering services of a high standard, delivered by motivated and skilled staff. We are part of a thriving parish community and parishioners are actively involved in supporting and enhancing the lives of residents in a number of practical ways. As far as possible we ensure that services and help are available to individuals at the time of their choosing. We pride ourselves on providing individualised spaces and care packages which help to promote independence and enable those who live here to keep control of their own lives. “I have been a resident here for just of the last six months. I find it all so peaceful and everyone so kind and helpful"
There has been a great deal of research undertaken regarding the optimum care and services for older people. The key to successful services and the recurring themes in findings are the importance placed by older people on fulfilment; security; stability; continued independence and “having ones own front door”. Here at Lady Katherine Housing and Care we provide all these things and continue to strive to provide a continuum of care from sheltered housing through domiciliary support services, respite care through residential care to end of life care, in a safe and therapeutic environment. The Parish church of St Mary’s is at the heart of the community at Temple Balsall. Lady Katherine Leveson School and the Leveson Centre for the Study of Ageing and Spirituality complete the wide range of our work and are situated in historic discrete buildings adjacent to the Care facilities. A number of the residents are actively involved in the parish and all enjoy and support the activities at the school. Our lively active community enables our older people to share their experiences with the younger people – both the staff and the children at our school. We here at Lady Katherine Housing and Care are able to provide a real community in which residents can thrive, and we augment the local transport system by providing regular shopping and social trips in our own bus thanks to a team of volunteers who drive the bus and act as escorts to the residents). Residents are encouraged to participate in all aspects of managing and planning our services. We have residents involved in recruitment of staff; organising fundraising; activities. 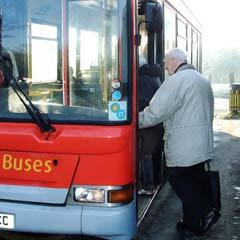 We regularly survey residents views on our services and we consult with them about all significant changes. Residents take an active part in church services and are always well represented at school functions and activities. Over the years we have been supported and encouraged by relatives of the residents and in 2006 the relative formed the Relatives Association who along side our Activities Coordinator organise and support a number of activities and entertainments throughout the year. We have regular entertainments provided on site and a number of special interest groups who meet weekly – including poetry reading, board games, lexicon, prayer group, film nights and computer club. (We have housed a small library and computer suite in one of our lounges to facilitate some of these groups).